Have you been invited to a party recently where you had to purchase a ticket? If that’s the case, you already had the chance to take a good look at the ticket’s design. The great thing about most party ticket designs is that they are filled with detail. Simple is not a word associated with party ticket designs. 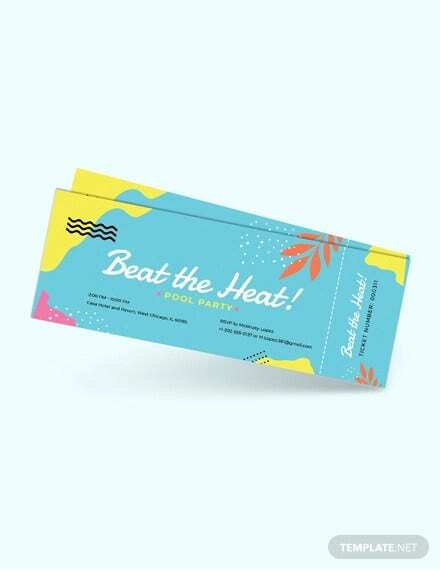 The detail seen in party ticket designs have inspired designers to make themes for party ticket designs and use it for their own event or occasion. You may have come across party ticket designs used in birthday parties or weddings. There are hundreds now available across the web, specifically in online design stores like Zazzle, Creative Market, Graphicriver, and Etsy to name a few. Check out these party ticket templates and use it for your own event. What lacks in the color of this Halloween party invitation template compensates for its detail. Images of a pumpkin, bat, spider web, and distorted trees bring horror to this invitation template. The font styles used also resemble a Halloween inspired style. This template has some very creative detail as it incorporates all the elements associated with Halloween. Use this template if you are going for a simpler and cleaner look that still excites guests. This $6 template is a self-editable PDF template as you can type your own text in any PDF reader (Adobe Reader is recommended). This template contains a 7.25 x 3.5 editable PDF file, 7.25 x 3.5 editable file, and a PDF help file. The word “Halloween” is not editable, though. Using one of the classic movie franchises as the theme for a kid’s party birthday party invitation is a no-brainer. Star Wars, the science fiction franchise created by director and producer George Lucas during the 1970s has produced eight feature-length movies (including the Rogue One spin-off) with more coming in the next few years, thousands of toy and apparel licenses, and billions in revenue for LucasFilm and Disney (Disney acquired LucasFilm in 2012). The film’s iconic characters and design have been attached to pop culture and the franchise is still going strong as the new films are being introduced to the younger generation. This Star Wars birthday party invitation uses its most notable character, Darth Vader, which is incorporated in the invitation template. Star Wars-inspired fonts are used to list down the event details while Star Wars-inspired designs (space, the Death Star, etc.) fill up the background. Similar to the other templates, the designer does all the work in adding the details. The template has to be purchased first before the designer starts to work on your project. This template costs $11, a bargain when you consider the details being incorporated in the template. Do you want to incorporate some Michael Jackson in your party ticket designs? Then use this “Thriller Night” Halloween party ticket template. The heading is enough to send some chills down your spine, but photos of women wearing their seductive Halloween attire will surely get you to dress up and anticipate the upcoming party. Glowing pumpkins, bats, and a night-time city landscape complete the design of this creepy yet outstanding party ticket template. This template costing $6 is fully editable and contains two fully layered Adobe Photoshop files (RGB & CMYK color options) and a help file with instructions and font links. Fall in love with this elegant Valentine’s day party event ticket template. This template has diamonds forming heart shapes complemented by a red background. Singles can also appreciate this template as it will inspire them to look for love during the Valentine’s party. White-colored text is used for the heading and event details that match well with the red gradient background. This $5 template is fully editable with fully layered files, with a 5.5 x 2 (5.75 x 2.25 with bleeds + trim mark) size, 300 dpi adjustment, and CMYK color mode. Links for the free fonts are available in the product page. Pokemon has been part of people’s lives all over the world. These pocket monsters (from which the word Pokemon is derived from) have not only been associated with video games, but with entertainment and culture as well. The Pokemon fan base is divided into two categories, the gamers and the toy collectors. Despite the differences, both still enjoy these cartoon characters which were inspired by a Japanese video game of the same name. 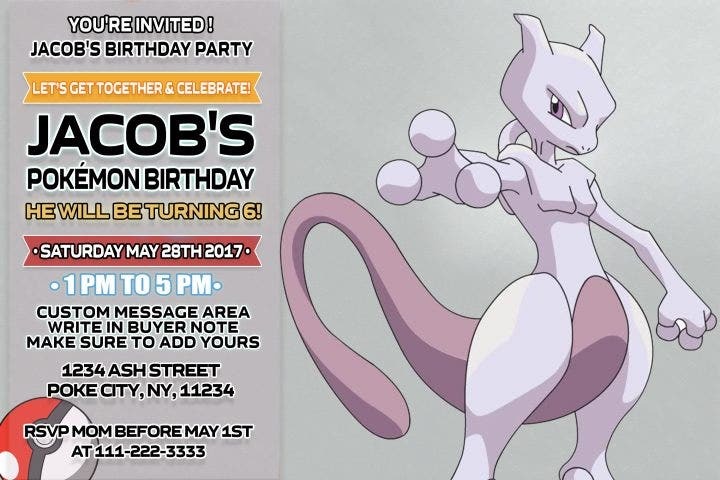 All children are familiar with Pokemon characters, so using this Pokemon-inspired birthday party invitation will bring excitement not only to kids, but also to adults. This template is also not editable as you need to contact the designer for the template to be made. 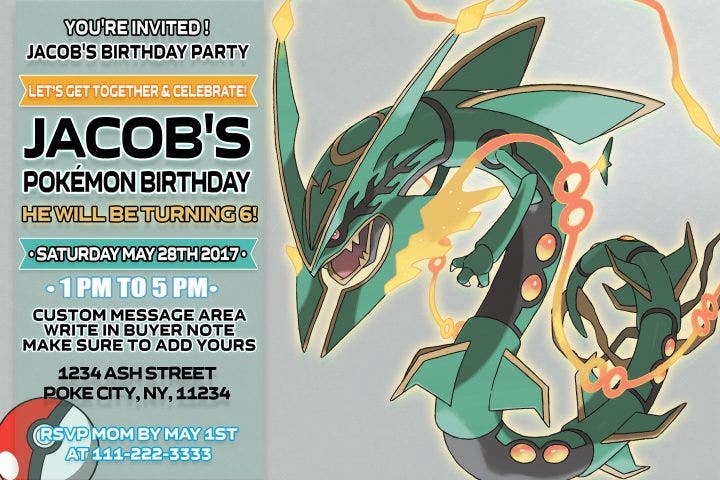 Just provide the designer the event details (name of celebrant, age, date, time and venue of party, and RSVP info) as well as the Pokemon character you want to incorporate in your design. The designer will create the design for only one day once the template has been purchased. Use this concert pass / party ticket template if you are planning to host a no-holds-barred party or organize a concert in the near future. 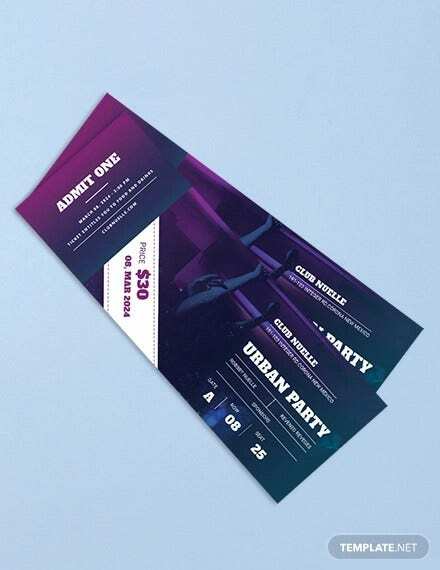 Silhouettes of people having a good time and raising their hands in front of glowing stage lights provide the central attraction of this party ticket template. Assorted shades of purple complete the details of the design. The event details are written on the right side of the template with a blank pink background for easy viewing. This template costing $5 is fully customizable with a 9 x 3 (0.25 bleed) size. It is also adjusted to 300 dpi and has a CMYK color mode. Fonts are available at the link provided in the designer’s page. NFL playoff season is the most exciting time for any football fan. A total of 16 teams from the American Football Conference (AFC) and the National Football Conference (NFC) duke it out until two teams remain to fight for the championship in the Superbowl. The playoffs also bring out millions of football fans from around to world to cheer for their favorite team to win the Superbowl. This mock-up playoff party ticket template uses a highly detailed in-game photo of two athletes while the main heading is embossed with a silver metal design. The other text are also given an “epic playoff feel” with the use of bold and and resolute font styles. This template costing $6 is fully customizable and set at 2013px x 788px (5×2” with .25” bleeds) with CMYK color mode capability. The template is also adjusted to 300 dpi with the colors and layers being named appropriately for easy use. Fonts are available in the page links. A kids’ party almost always needs to have kid-friendly characters for it to be a truly fun and entertaining party (and no, Deadpool is not considered kid-friendly). 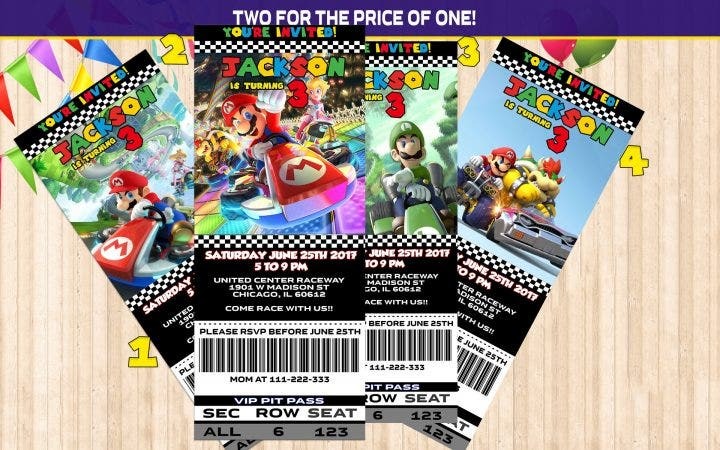 This Mario Kart birthday ticket invitation uses one of the most beloved and iconic video game characters, Mario, and his highly popular video game Mario Kart which sold over a million copies worldwide and has spawned dozens of versions over the past decade. The colorful 3D graphics in this template are wonderfully designed and complement the secondary race flag and bar code designs. This will surely become a hit with the children but also with the adults who have grown up playing those classic Game Boy and Nintendo Entertainment System (NES) Mario games. This template is not editable as you need to contact the designer for the design to be made. The details will be added (name of celebrant, age, date, time and venue of party, and RSVP info) once the purchase has been made. It will only take one day for the designer to accomplish the design. 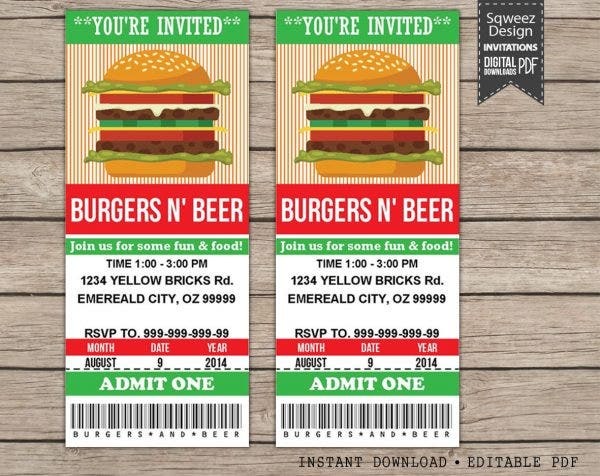 Despite its semi-flat design, this burger barbecue party ticket invitation template will still make the mouth of your guests water. Appetizing is an understatement to describe the burger image which contains two layers of patties, cucumber, cheese, tomato, and lettuce. Guests always look forward to events which involve eating and drinking, and this party is no different as barbecued burgers are some of the most delicious and popular foods in the world. Semi-flat designs have been used as an alternative to flat designs which represent a minimalist design (3D dimensions such as textures, shadows, and gradients are omitted). Although semi-flat designs still highly resemble flat designs, they now use small bits of 3D elements to have a better visual impact. This template contains a PDF file with four tickets per 8.5×11″ page and is downloadable once it has been purchased. This is also editable and you can personalize as well as edit the file with Adobe Reader. The holiday season is still months away, but don’t stop that from starting your preparations early, specifically choosing the perfect Christmas party ticket template. 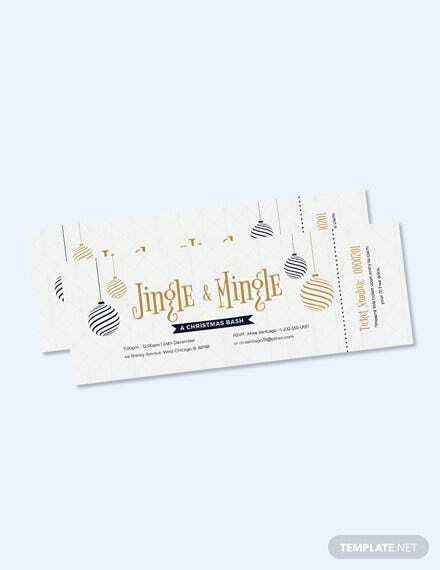 This beautiful gold and red Christmas office party ticket template uses Christmas colors and effects to great use. The event’s main details (heading and event date) are written with a metallic gold design with a bright red gradient incorporated in the template’s background. This is a truly elegant party ticket template that is highly recommended. This template only costs $7 and is also available in four colors (pink, purple, brown, and orange). This template is also fully customizable with organized layers, coded colors, 300 dpi adjustment, and CMYK color mode compatibility. Use pop culture elements. Similar to the Star Wars, Pokemon, and Mario templates above, using pop culture elements (themes and characters from popular movies, music, and television) adds a different layer to your ticket templates. It adds to the guests’ excitement and also brings a more contemporary feel to your designs. For example, themes from Marvel and DC movies are widely used in designs for the past decade and started when the first Iron Man movie was released in 2008. Use color combinations. Color always adds to the design’s aesthetic. Without them, the design becomes bland unless the images are highly detailed to compensate for the design’s lack of colors. Have two or three color combinations or incorporate the entire color chart in the design. Party tickets are intended to be colorful, so a variety of color will have to light up your party ticket template. Make the text readable. This is the most important factor in any design if text is involved. The detail and color will mean nothing if the text is too small or is buried under layers of images and colors. There is no font style requirement, but the event details should be read clearly by the guests. 17+ Amazing PSD Beach Party Flyer Templates & Designs! 12+ Creative Slumber Party Invitation Templates & Deisgns!